I taught myself to knit because I've wanted to make a Mythbusters afghan for a long time now. I used a fan art picture because it cartoonized Adam and made it easier to do, this is crochet btw. The knitting didn't work out how I wanted it to. This is also the furthest along in the blanket I've gotten. I probably should have made sure I had a good skin color before starting too. I'm not sure, I think I may try Jamie now since I've got about 7 or 8 partial Adams. I keep seeing these on Etsy and really wanted one. It looked fairly simple so I browsed around for a book that would fit, from Barnes and Noble's Classics Collection, and found some fabric scraps. The handle and button closure I got from Joann's. I think in total this project took a few hours and cost $25. Much cheaper than anything online, and it was fun. 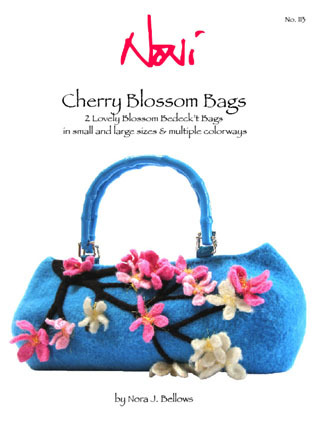 I'm going to make some as gifts now. I know she's only 4 but I love her birthday. 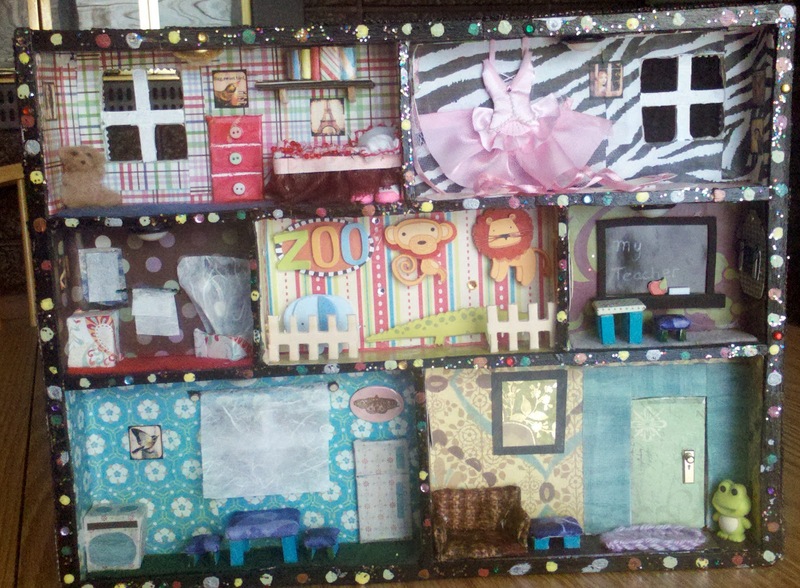 I wasn't sure about what to do until maybe February and I'd gotten a book on mixed media doll houses and started this one. It was a wooden tray and I sawed off the handles and filled it in with cardboard and covered both sides. Then I glued in the walls and floors and spray painted purple. Of course while drying outside it rained a bit and I'd gone to the store so I came home to a wet tray. The enamel paint protected it pretty well and I only had to redo a wall or two. 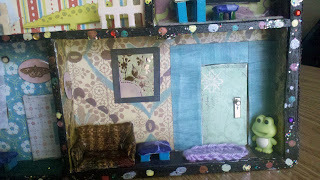 I covered each room with scrapbook paper and then cut out windows. I should have switched the order on that one... After touching up the window edges with more scrapbook paper I glued in the window pieces. I bought some scrapbook stickers, the really cool kind, for the ballerina, zoo and school. I also bought some balsa wood which came in a 'picket fence' style. I started with the bedroom. 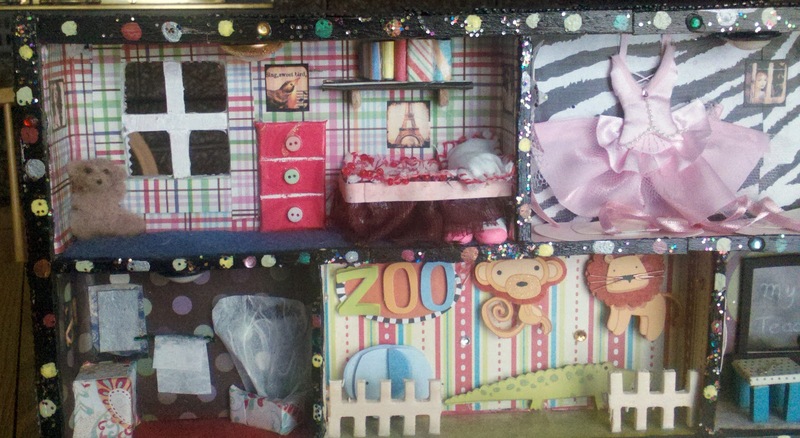 The bed is chipboard and fabric, with a sheet too. I sandwiched some quilt batting with pink fabric and hand sewed around adding beads. Then the pillow with some poly fill. I glued those down and then made a bed skirt with some nylon curtain remnants and then glued it all into the room. 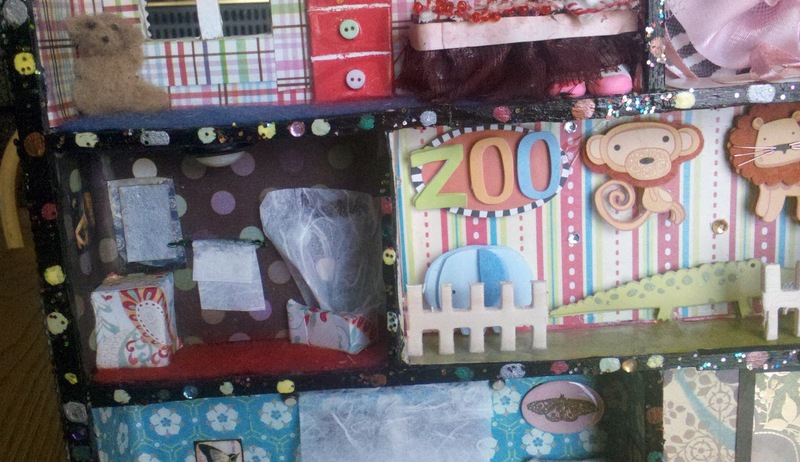 I added the rectangle of cardboard covered with more scrapbook paper and sanded out 2 lines for drawers. There's some cute bday cards at Costco I buy all the time so I'd gone through them for extras on the dollhouse and on a new baby card I found some teeny buttons, for the drawer handles. Then another small piece for the shelf and balsa wood for the supports. 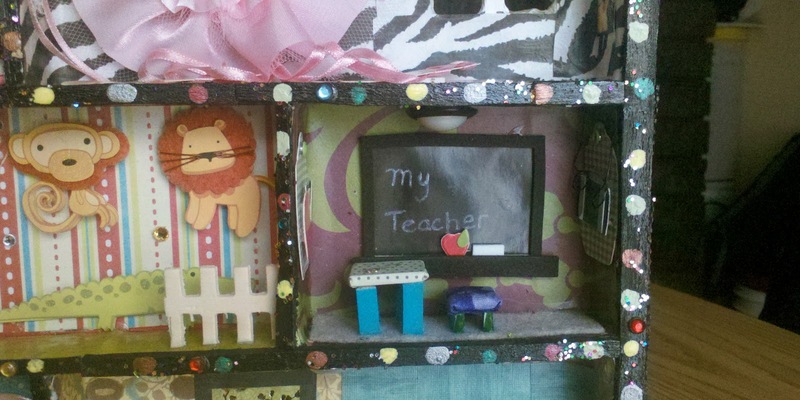 The 'books' are folded cardboard from a cereal box (Crunchy Nut) covered with more paper and glued down. I really wanted a tiny teddy bear and actually looked at Hobby Lobby in their dollhouse parts. No luck. I couldn't find anything small enough in the scrapbook section either. I did learn how to felt a while ago and sat down, turned on the Walking Dead and made a bear. He got glued down too. I also needed a shoe or two under the bed and found some erasers at another craft store. The bathroom is more paper and cardboard. I painted some paper silver and used mulberry paper for the shower curtain and towel.. Oh yeah and felt for carpet on some of the rooms. 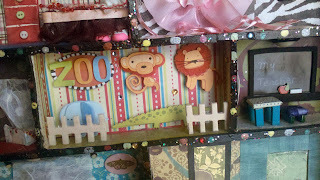 The zoo was pretty simple, I glued all of the stickers from the pack and added the rhinestones. The fence was leftovers from what was going to be in the front of the house but got changed. 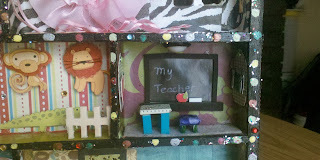 The chalkboard was in a sticker pack along with an apple and glasses on the side walls. 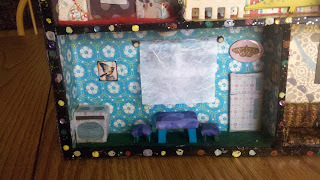 The desk and char are from covered cardboard and fabric with more quilt batting. The legs are balsa wood painted blue. The frog is another eraser. I decided not to buy any actual doll house parts since it would be too easy and instead made everything, except for the doorknob and 2 keys that came with it. One key is on the desk and one is on the bookshelf in the bedroom. The couch is cardboard, batting and tapestry fabric, the end table is the same as the chair in the school room. The rug is something I crocheted with the skinniest yarn I could find. The door is cardboard with fabric on both sides glued to the wall and outside so it moves easily. The kitchen was fun. The table and chairs are the same with batting and fabric. A rectangle of cardboard covered for the refrigerator and handles. I glued mulberry paper onto wire and then over the window. I used snipped brads for the ends of the curtain rod. This was so much fun to make! Ok, the outside. It was originally some brick scrapbook paper. Nope. 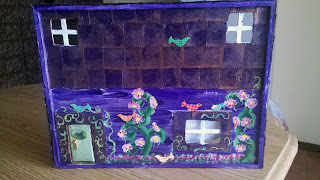 I have a die cutter and a small postage stamp die and cut up about 50ish pieces of a cereal box for the shingles. Each one is painted watery purple and then water copper which is then wiped off. After I dip each of the 4 sides into the copper about 1/8th of an inch and let it dry and then glue on. Cut in half I did similar with the windowsill. 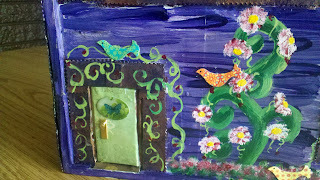 I painted the front with purple and white and then added some vines and flowers around everything. The birds were from one of the birthday cards I scavenged from my stash. After it was all done I printed up some scrabble tile sized images and glued them everywhere that needed an extra picture on the wall. I added some stickers on the door and a few other places glued with epoxy. I did paint some little people but didn't take pics.